Cream Cheese Filled Carrot Bread - Bake.Eat.Repeat. 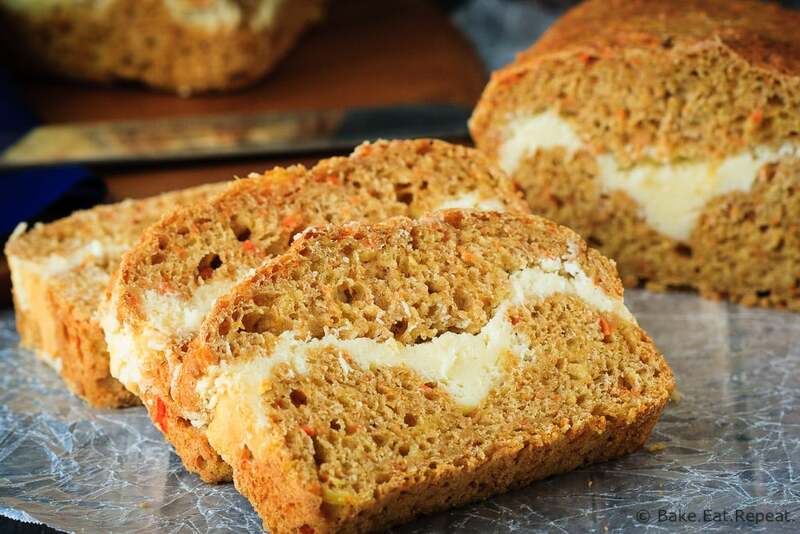 A healthier carrot bread filled with a cream cheese ribbon – healthy enough for breakfast but enough like carrot cake to feel like a treat! 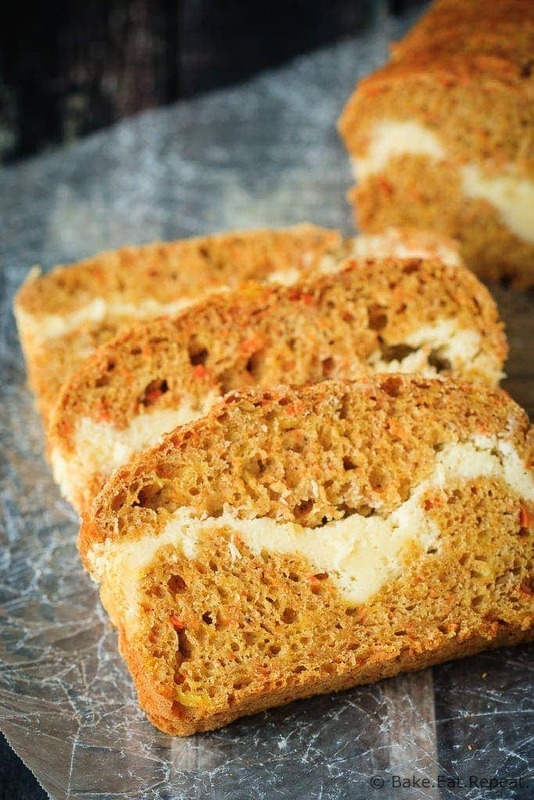 Carrot bread that tastes like dessert but is healthy enough for breakfast. That’s what we have happening here today. And I’m very happy about this. Because I made at least 4 versions of this bread before finally deciding that I had a winner. The kids kept saying every version was “blog-able”, but they were so very wrong. They were all edible, I’ll give them that, but that’s about it. Definitely not good enough to share. Evidently kids aren’t the best food critics. It has cream cheese icing? It has nuts? It’s bread, that I can eat? Blog-able. That’s pretty much the way their critiques usually go. I can eat it – I’m in. Don’t worry though, this version is more then just edible. It’s fantastic. Cream cheese filled carrot bread. Because why make plain old carrot bread when you can fill it with cheesecake and basically have dessert for breakfast? Everyone loves dessert for breakfast. Especially when said “dessert” is actually quite healthy. This bread has no oil, no butter, and very little sugar. The recipe makes two loaves, so there is 1/3 cup of sugar in each loaf of bread, which isn’t much as far as quick breads go. There are 4 ounces of cream cheese in each loaf, (because we’re pretending this is dessert here and what’s carrot cake without cream cheese?) but to be perfectly honest the bread is great by itself so you could easily skip the cream cheese filling and make the bread plain if you like (bonus to doing this – half the sugar is in the cream cheese filling). But then you can’t pretend you’re having dessert for breakfast. And everyone loves dessert for breakfast. Just ask my kids. It’s blog-able. A healthier carrot bread filled with a cream cheese ribbon - healthy enough for breakfast but enough like carrot cake to feel like a treat! In a medium bowl, mix together the cream cheese, sugar, egg and flour with an electric mixer until smooth and well combined. Set aside. In a large bowl, whisk together the whole wheat flour, all purpose flour, baking powder, baking soda, salt, cinnamon and nutmeg until combined. In another bowl whisk together the grated carrots, pineapple (with juice), brown sugar, yogurt and egg. Add this mixture to the dry ingredients and stir until just combined. The batter will be quite thick. Spread a little more then a quarter of the batter in the bottom of each of the two prepared loaf pans. Spread half of the cream cheese mixture on top of the bread batter in each pan. Cover the cream cheese mixture with the remaining batter, half into each pan. It is thick batter so put small spoonfuls all over the cream cheese and then spread it out as well as you can - it’s okay if some of the cream cheese filling is still showing. Bake the loaves for 50-60 minutes or until a toothpick inserted into the center comes out clean, or with only a few crumbs. Let the bread cool in the pans for 15 minutes and then turn it out onto a wire rack to cool completely before slicing it. I blended the can of pineapple briefly to make the pineapple pieces in the bread very small, but it’s not necessary if you don’t mind small bits of pineapple throughout the bread. Source: Adapted from my Carrot Pear Mini Loaves . Not a fan of pineapple. Understand it gives the bread moisture but.....could it be omitted? Hi Rosanne, you could omit it but you'll want to replace it with something. I think applesauce or mashed banana would work well, but I haven't tried it myself. I think I would lean towards using applesauce in this recipe. Just make sure you have the same amount (14fl.oz or 398mL) so the amount of liquid in the batter is still the same. Anything that tastes like dessert but is healthy enough for breakfast is a winner in my book! 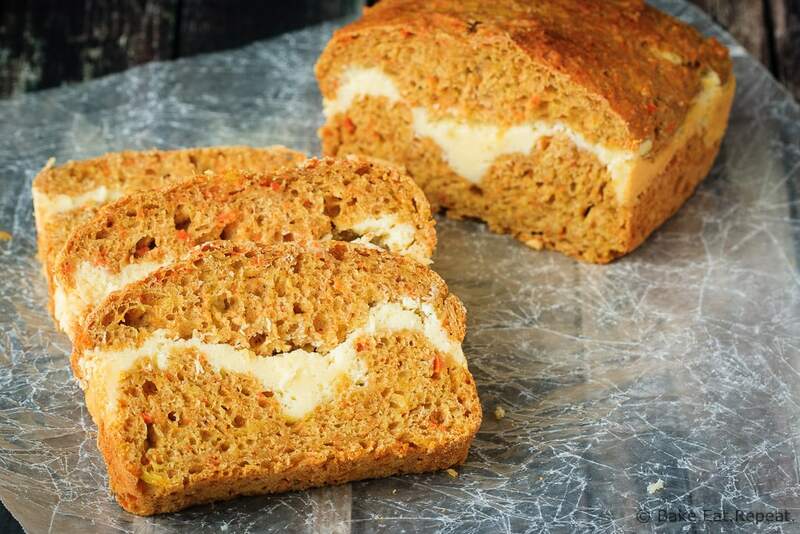 This carrot bread looks fantastic, Stacey! I love the cream cheese in here. Sounds so perfect!